I have actually been counting down the days until it was time to do this end of year review. We have had the most amazing year ever. Just thinking about it makes me smile. And I’ve been itching to reminisce. Travel is something we hadn’t done much of since having children, and something that I’ve really missed. We certainly made up for our lack of travel in 2017, and my heart is full looking back at all of our adventures. Our first trip of the year was to Devon and Bristol in February half term. We had a great time at Butlins at the beginning of the year, too. Sam, Otto, and I visited an extremely beautiful area of France for a friend’s wedding. Over the Summer holidays, we spent a wonderful two weeks in an absolutely breathtaking part of the Costa Brava. During the summer holidays, we were given the most FANTASTIC last minute opportunity to go to Disney World as part of a Mumsnet blogger opportunity. It was THE trip of a lifetime, and all these months later I am still in disbelief that it happened. We had a great time making videos and content for Disney, and it is to date the absolute best thing I’ve ever been able to do for my family off the back of my own work. I am super proud about this. 2017 was very much the year of adjusting to life as a family of five, and transitioning from two children and a baby, to three children. I wrote a post called Growing our Tribe, all about Otto firmly cementing his place in our family setup. In May, our baby boy turned one year old. As I’ve done with all of my children, I made him a video montage of his first year. These are some of my absolute favourite videos to make and to look back on. Towards the middle of the year, I embarked on the slow journey to weaning Otto from breastfeeding. First came stopping day time feeds, which was a surprising revelation for me. Then, I night weaned Otto, eventually stopping breastfeeding altogether at 16 months – much earlier than I did with the other two. It’s harder work when he wakes in the night, but I’ve found it surprisingly freeing, and I don’t miss it. 2017 was a big year for Rory, as he started his reception year at school. I was really not looking forward to this happening. He seemed so young. But he’s adjusted fantastically and loves school. In September, when Rory started school, we made the decision to send Otto to a childminder for two days a week. I’ve always wanted some form of regular childcare, I never wanted to “stay at home”, but this was the first year we could consider it, financially. Some months I just about break even, but it was absolutely the right decision to prioritise myself, and I feel much happier and driven now that I have my own set work hours. After undertaking a huge scale house build and renovation in 2016, this year has seen us slowly work on the many DIY and interior design projects that we still have to finish. We transformed our front garden from drab wasteland to a modern, usable space and we LOVE IT. We installed a black wood floor in our living room, which is one of my favourite features. We’ve slowly worked on our living room this year, adding back in the original fireplace, and getting a new modern sofa. We completed our first little vanity project in our kitchen. We never do any home improvements purely just because it looks good, so having our herringbone kitchen tiles fitted was the first such indulgence of this kind for us. We didn’t need tiling, but we wanted it. And I adore our herringbone tiles. It adds a much needed focal point to balance out our kitchen that I hadn’t realised was needed before. What’s in store for my blog in 2018? I spent a lot of time in 2017 trying to grow my instagram. I focussed on honing a cohesive feed, thinking that was holding back growth. It hasn’t changed anything. But in the process, it took away a frustrating amount of time from writing blog posts, from creating content. So, in 2018 I am doing a 180 and spending less time and effort thinking about growth, and more time creating and being inspired. I’m going to spend less money on courses for social media, and on blog conferences, as I’ve yet to find one that has proved groundbreakingly life-changing. Frustratingly, for the past few years, I have felt very much stuck in the contradictory circle of wanting to create for the sake of creating, (why I started in the first place), to wanting to “keep up with the Joneses” and grow grow grow. I think this is always the way when “content creation” becomes your main income source, and these days you really do need to be across all social media platforms and have competitive stats. I need to earn, but I want to cut out the time-wasting and focus on more meaningful content in 2018. I’m here for the words and the videos, and I’m hoping that 2018 will be the year brands increasingly value meaningful engagement over enticing numbers. The things I write and talk about matter so much to me, that given the option, I would always choose for my content to speak strongly to a few, than create a tiny, temporary ripple in a vast ocean. In ‘blogger speak’, I am so so proud of my ‘engagement rates’. From conversations started in my Instagram comments, to the many people who have ever left me a comment on here saying “I don’t usually comment on blogs, but…”, it honestly means the world that what I’ve written has either helped or moved you in some small way. In 2018 I am going to write more. And I am going to read more. I am going to make time for seeking out inspiration. I am going to focus less on the children in my writing, and more on me. I am going to focus on creativity, not blogging admin. I am loving documenting day to day life on Youtube and Instagram Stories. You see a lot less of that over on my blog now, as I love the connection that video brings. (if you miss the sort of everyday output that my blog used to hold, please do come and follow me over on Instagram and Youtube, where all of my daily life ramblings are these days). This has all led to a redefinition of what my blog means for me, what it provides me, what use it serves in an age of multi-platform content creation. I have known the answer for a while, and 2018 is the year to set aside the time to put it into practise. If my Youtube channel is now my main place for documenting family life, I want my blog to be about stories. For the times when only words will do, and the moments when I get the urge to sit and write it all out. Over the last half a year, I’ve been revisiting my unplanned start into parenthood. 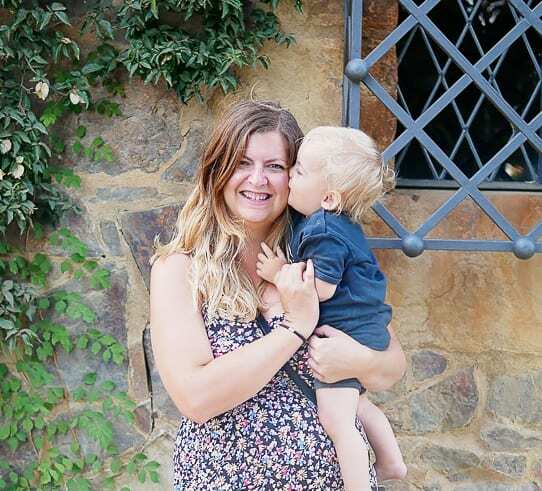 Things that I never wrote about before on my blog, when I’d mask the fact I was still processing this MASSIVE life upheaval with updates about baby Arlo and how great it was to be a mum. I had the urge to write it all down, and I knew that my blog was the only place for it to go. So, you will start to see posts about that soon. My blog is going to be about stories of my life. I am going to set aside time each week just to write, which I hadn’t pro-actively been doing in 2017. And I’m really excited about delving into it. What’s in store for our family in 2018? The fact that we had such an awesome, jam-packed year this year makes me slightly nervous about 2018, when all our plans and efforts are focused on just one thing, our wedding. I loved starting 2017 knowing we had lots to look forward to. Don’t get me wrong, I am so looking forward to our wedding, but it’s ONE DAY. The fact that we are having a wedding means that financially a whole lot of other plans like home improvements, travel, and family time has had to be put on the backburner. It was always going to be this way once we had children, but at the same time it was really important to both Sam and I to have our big wedding – we’ve been talking about it for years and both felt we’d be missing out if we didn’t ever do it. I know from past experience that having few plans for the year has made me feel ungrounded, so it will be interesting to see how this year pans out overall for me. Perhaps 2018 will be the year I finally address my ridiculous compulsion to be doing and experiencing everything all at once. Another reason I’m entering 2018 with trepidation more than excitement is because I feel it’s a crossroads year for us. A year where we will, at some point during the course, most likely make some big decisions about “What’s next?” for us as a family. Will we decide to move to a new location and where will we go? Does my not-so-secret longing for four children outweigh the great balance I feel that we have with three children? I feel an increasing need to provide myself with a satisfactory answer about the two questions that frequently occupy my thoughts before I go mad with the too-ing and fro-ing. So, 2017, you were truly ace. You provided us with no huge upheaval or changes, just a whole lot of fun as a family, which is my favourite thing ever. 2018…I have no idea what you will look like, but let’s find out.